Fix for a glitch occurring when cooking without a wood fire oven on the lot. Fix for a glitch with the missing ingredient column in the recipe selection window. Fixed a blunder causing the recipe selection window to not properly register whether the lot had the proper appliances/counters needed for cooking. The pop-up recipe selection menu on the fridge now has separate tabs for recipes associated to the Wood Fire Oven, Teppanyaki Grill and Bakers Station (requires the associated module for the object). Unlocked and the "Ask to Cook" social interaction, which allows sims to request another sim to cook a meal for them. 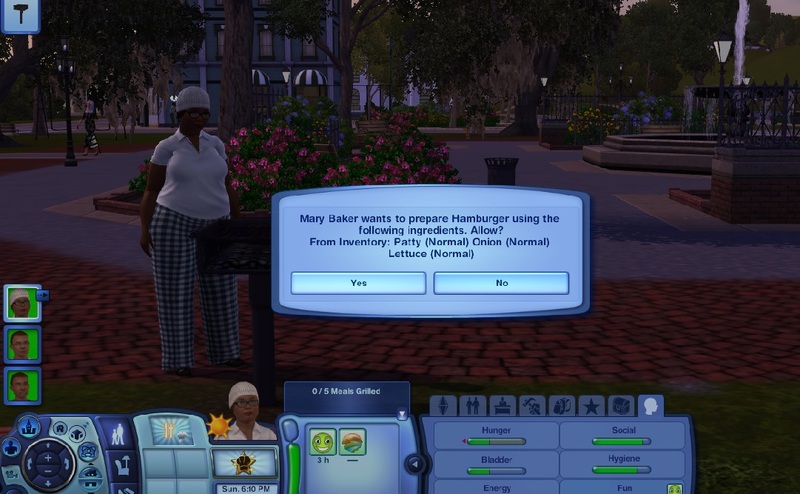 If they accept, the interaction now brings up a recipe selection menu for the player to choose which recipe the sim should cook. You can now choose specifically how many portions in a group serving to make, via a pop-up that appears at the end of cooking. Interaction to rename a dish added to the dish itself. With the Tuning file, the base game Birthday Cake and the Generations Wedding Cake can now be cooked with this mod. For modders: Added ability to cook custom birthday and wedding cakes loaded with CCLoader. The ingredient selection menu will always as a pop-up even when the mod is set to back to the pie menu style for selecting recipes. 22-NOV-2015 (Sauna): Now compatible with the latest version of the main mod. 19-NOV-2015 (Main mod): Interactions should no longer disappear when a sim autonomously goes for a snack from the fridge. 12-SEP-2015 (Main mod): Fix for a problem occurring when sims bake the Birthday Cake from the store bakery set. Sims can grill on community lots without counters again + fix for an error that would occur when cooking with the food processor. If the game was saved WHILE a sim is cooking with the Wood Fire Oven/ Teppanyaki Grill/ Bakers Station the sim will almost always drop the interaction and reset when you load the game again. It's not going to permanently destroy your save or anything but just be warned that it happens. As long as the interaction being performed by the sim at the time of saving doesn't involve any of these objects though, there should be no problem directing them to cook with them as long as you queue it AFTER the current interaction. Fix to prevent the game possibly crashing on load if a sim was autonomously trying to cook literally as you last saved. Main mod: Fix for a bug in the previous version that would occur when sims tried to cook autonomously. Teppanyaki Grill: Another attempt to curb overzealous cooks from constantly wanting to cook with the grill autonomously. Choosing recipes and ingredients to cook is now done through pop-up menus instead of the regular pie menu. If you prefer the regular pie menu (which gets incredibly bogged down by the sheer amount of recipes available especially with this mod), you can change this setting in game or in the Tuning file (see the Settings section below for how). Ingredients chosen will now appear on the food tray used at the start of cooking. When using the "Buy From Store" option for a recipe that requires an ingredient that cannot be bought from the Grocery from the current world, a different ingredient from the same category will be bought instead. (Tuning file) Completely reformated how the extra recipes are listed in the tuning file, allowing you to define more than one required ingredient for each extra recipe AND for quick meals to require ingredients if you want. See the Extra Recipes section for details and for instructions should you wish to make any personal changes. The information for the extra recipes is now in a tuning file SEPARATE from the main mod. This is so that any changes you make to that file won't be overwritten every time I update the main mod (or if you prefer not to have the interaction menu be clogged up by those extra recipes you can just choose not to download the tuning file). Please download the icarusallsorts.CookWithAnyIngredient_Tuning package if you want the extra recipes to still show up in game, you are still free to edit it with S3PE as you see fit. Fix for a blunder I made that caused almost all cooked foods to provide the Life Is Sweet moodlet if you had Supernatural installed. This should now only happen with desserts cooked with Honey as intended. All toy oven recipes (listed in the tuning file) and Baker's Station recipes (except the bread ones) are now considered as dessert in game so long as you have the appropriate modules installed. Redid the store item interaction names so that they (hopefully) appear to make more sense in languages other than English. Sims should no longer be able to cheat and buy ingredients they normally wouldn't be able to at the Grocery (depending on the world) when cooking autonomously. Non-vampire sims will not cook with plasma fruit unless directed by the player. Baked Angel Food Cake cooked without any Flame Fruit lose their flame effects. Also flame effects from servings of food with flame fruit in them should retain those effects even after being put in an inventory, and the flames also transfer to single portions taken from group servings without needing any external mods now. Herbs and coffee beans can now be chosen as ingredients when cooking. When cooking with herbs the resulting dish should provide the effect of the highest quality herb used when eaten. The wish to add an herb to a dish should also be fulfilled when the dish is complete. Cooking a dessert dish with Honey now automatically counts as sweetening it up. Sims can once again buy ingredients to cook when using grills on community lots without fridges like they could in an unmodded game (so long as AllowBuyFromStore is set to true). EDIT: Fixed the interaction name in the Sauna module. 16-MAR-2015 (Main mod & Sauna): Fixes for the problems with the previous version causing sims to not be able to cook when clicking on appliances other than the fridge and all the optional modules becoming non-functional. (Besides the main mod, only the Sauna optional module needs to be redownloaded, all the other optional modules are safe to use as they are). 14-FEB-2015 (Main mod only): Vegetarian and non-vampire sims who were directed to cook meals with either meat or plasma fruit while hungry would still be automatically pushed to eat the meal directly after preparing it since they don't know any better. Current version should stop this (unless the sim is REALLY starving, since puking 2 hours later seems like a triviality compared to death). For those of you using this mod together with ani's No Fridge Shopping mod, I've put up a version of it (hosted over at the NRaas Wiki) that no longer conflicts with this current version. You can find it here. 8-FEB-2015 (Main mod only): Fixed a mistake in the previous version that stopped sims from cooking when clicking on any appliance besides the fridge. 6-FEB-2015 (Main mod only): Tidied up some code to hopefully reduce any possible lag when clicking on fridges (started to get noticeable the more recipes your sim knows). Fixed the translations for the ingredient qualities used in one of the prompts. 10-OCT-2014 (Main mod only): Only now realized that the mod wasn't updating the quality or prompting me to rename servings of Peanut Butter And Jelly. Fixed. Baker's Station: Added Cherries as a required ingredient to the Cherry Pie and Cherry Cobbler recipes. Main mod: ( Required for the optional mods) Fix for a potential problem when maids try to snack on the job. Butlers should now consider sims older than children as well when deciding whether or not to cook a group meal. Wood Fire Oven: The code adding moodlets to sims when eating food from the oven was running on all sims eating any food whatsoever. Fixed. Sauna: Tidied up the code. Note: If you try renaming any of the new cakes, the new name will only show up on individual plates once the cake is sliced, but not on the main serving unfortunately. Main mod/Teppanyaki Grill: Tidied up some code, made accommodations for the following changes. Wood Fire Oven:Sims should no longer reset when trying to make Pepperoni Pizza and it should be possible now to make higher quality meals on the oven. Make sure to download the updated main mod! Main mod: Sims can now cook food from the LN Bars and Food Truck, Seasons Concession stand and IP Resorts which they normally could not. The Ambitions Children's oven recipes and Steamed Veggies from the Store can also be cooked (by teens and adults) on regular stoves now. Scroll down and read the Extra Recipes section for details. Sauna/Wood Fire Oven/Teppanyaki Grill: Updates to keep in line with the main mod. Make sure to download the updated version of the Main mod as well. Sims would still continue cooking even if their way to the fridge was obstructed and they didn't manage to get the ingredients they needed. Fixed this. Added a custom interactions to the food trays created during the cooking which allows sims to continue cooking from where they left off if the process was interrupted before they could start. By default the quality of the food prepared on either of these objects did not take into account the quality of the ingredients used, the cooking sim's traits or Cooking skill challenges completed by the sim (unlike food cooked on non-Store appliances besides the Food Synthesizer). Now they do. Sauna mod: Minor update to keep in line with the above changes. 13-MAY-2014: Main mod: The permission pop-up should no longer appear when roommates cook. 5-MAY-2014: Main mod: Fixed the "Prepare..." interaction. Sauna mod: On the other hand, inactive sims are now blocked from autonomously cooking with the Sauna (active sims may still do so if they have the right ingredients in their inventory). New optional mod for the Teppanyaki Grill (special thanks to igazor for this one ) REQUIRES THE LATEST VERSION OF THE MAIN MOD TO WORK Just like the previous optional modules, not only do you get to choose what ingredients to cook with on the grill, the ingredients will actually go into in the dish (otherwise they just vanish into thin air), and sims are no longer automatically pushed to eat the food after cooking so you can choose what to do with it. And I've disabled the changing into the chef's outfit as well (but not for the other trick performance interactions) since I had a feeling most people might want that. Main mod: Updated to be compatible with the optional Sauna mod. please redownload if you want to use it. Wood Fire Oven mod: Sims will no longer immediately eat or clean up whatever they just made using the oven so you get to choose what they do with it. Added Spanish ES and MX (coto39) and Danish (Misling) translations. Tired of your sims using up those prized perfect Life Fruits in a plate of Pancakes without you knowing? Want to use more than just boring old Lettuce in your sim's Autumn Salad? This mod lets you specifically choose the ingredients your sim will use to cook with and warns you when they decide to autonomously cook with ingredients you potentially want to keep. Even more, the mod lets you pick ANY combination of ingredients to cook meals with so you aren't tied to recipe restrictions. displays a window showing the ingredients in your sim's inventory and fridge for you to choose from. The ingredients that the recipe requires are displayed, BUT you are free to choose ANY combination of up to 3 ingredients to cook the recipe with. (The one exception is Ambrosia, which must have its required ingredients selected to be cook, but you can still add an extra ingredient to it if you want). Cook any recipe at any time! Go ahead and let your sims have steak for breakfast and pancakes for dinner. Cook anywhere you want, even community lots: specifically sims can cook actual foods on community lots instead of only having quick meals available to them. Vegetarian sims will react according to the ingredients used in a cooked dish instead of just the recipe (e.g. they'll become nauseous eating Autumn Salad made with steak for example, but will be fine eating Tri-tip Steak made only with vegetables). Choosing herbs as ingredients when cooking a meal will automatically give the meal the effect of the strongest herb used. Similarly using honey as an ingredient when cooking a dessert automatically "sweetens" the dish up giving sims eating it the Life Is Sweet moodlet. Horses can gain extra moodlets when eating Horse Granola cooked with either apples, carrots and or meat (!). Each of the optional modules (Wood Fire Oven, Sauna, Teppanyaki Grill, Bakers Station) allows sims to cook their object specific recipes using ordinary stoves and grills so you no longer need to place the specific store object on your lot to cook them (you just won't get the additional perks like the wood oven moodlets). They also contain fixes to these recipes like correcting missing/mistyped ingredient requirements and recategorizes the pies, cobblers, cookies and cakes as desserts. Cooking AskPermissionToCook true/false Turn on/off the prompt asking for your permission whenever a selectable sim or butler tries to cook autonomously. If false, these sims will always be allowed to cook autonomously. Cooking ChangeFoodQuality true/false Whether or not to readjust the quality of a meal if it was cooked with ingredients other than its standard recipe ingredients. Cooking ShowRecipeMenu true/false true -> Use the new pop-up menu to choose recipes; false -> Use the default pie menu to choose recipes. *All cheats go by "Cooking" + Space + "..." + Space + "true" or "false" to turn the setting on or off. *You can also view these in the list of cheats when typing "help" in the cheats console. For every cookable recipe in the game there is a separate XML in the GameplayData for the recipe detailing its cooking steps i.e. whether to chop/mix ingredients, put in a pan/pot, cook on a stove/in an oven/on a grill etc and in what order. By default, none of these extra recipes have such a cooking process XML, so in order to make them cookable one needs to create custom XMLs for these recipes which is possible using just S3PE. However the sheer number of these recipes makes it a potentially daunting task to tackle all of them. (Still hopefully someone would like to actually do this one day?) As an alternative method, for each of these extra recipes, this mod will take the cooking process from an existing cookable recipe and copy it over. Required ingredients can also assigned to these recipes as well since most of them have none. The example line indicates that Garlic Fries (from the Seasons EP) will require one potato and one garlic, and will be prepared in the same fashion as Vegetarian Fish And Chips is prepared (i.e. fridge -> prepare ingredients on cutting board -> cook using frying pan on stove etc). Extra recipes marked with an asterisk * will treated as desserts by the game. Ingredients must be separated using a slash /. If no ingredient is specified and the extra recipe does not already have any required ingredients by default, the recipe can be cooked with any ingredient. Use the <Recipe_Key> values in RecipeMasterList XML for the extra recipes and the <Recipe_Class> values for the reference recipes. Only extra recipes with the required expansion installed will appear in your game. However, the mod can still borrow the cooking processes of recipes from ANY expansion even if you do not have it installed (just note that in this case animation props that require that particular expansion may not appear while the sim is cooking, but this doesn't block the actual cooking in any way). You can add quick meal recipes to the list to have them require ingredients to make (whatever cooking process you try to give it though will just be ignored so don't bother to giving them one). Example: Adding Cereal:Fruit to the list will cause cereal to require one fruit to be made in game. You can add PineappleJuice, VirginPineappleJuice, CoconutJuice, VirginCoconutJuice to the list (with or without any ingredient requirements) to unlock these quick meals on regular fridges. Finally you can add recipes (other than the above extra recipes or store recipes currently) to kExtraSaunaRecipes to have the recipe available to be cooked on the Sauna with the Sauna module. No Shopping from Fridge by ani_: The current version of this mod will not work with the version of the ani's mod provided here on MTS, you'll need the updated version of the No Shopping From Fridge hosted on the NRaas site. Buzzler's Moar Interactions (which adds cooking interactions to fridges on community lots): No conflict, the interactions from both mods will appear on appliances in community lots if used together. ANY of the Cooking/Ingredient Overhaul mods / ANY mod that adds new custom ingredients: No conflict. If you have a custom ingredient that can't be selected for cooking with this mod, it is likely that the ingredient was marked as non-edible by its creator i.e. the line "IsEdible>" line in the XML defining that ingredient has to be marked True, so you'll either have to make this change yourself or request for the creator to do so. Since this mod replaces most of the game's default cooking interactions, it is only guaranteed safe to remove the mod if there are no sims cooking in your saved game otherwise there is a risk the save will not load. I suggest resetting all sims just before saving if you plan to remove the mod and/or installing NRaas ErrorTrap before loading a save after removing the mod which should help catch remaining errors and allow the game to load in case there is one. Also if you were using the main mod together with any of the optional packages remember to remove ALL of them if you plan to remove the main mod. This mod is fully translatable You'll have to open the package using S3PE or NRaas Packer or s3se to see the English strings that require translation. Translations can be posted in the comments.